In the State of Israel there is no freedom of religion. In my recent visit to Jerusalem, while sightseeing in the city I decided it would be worth my while to also pay a visit to Temple Mount. I was told that it could be a challenge as the line of people who wish to go up and visit is long and the time frame to do so is short. I stood in line already at 7:00am and checking in started at 7:30am. In no time I found myself standing in front of the security personnel. The security man I faced first asked me if I was alone or with a group. I told him I was alone. Then he continued and asked me if I was Jewish and if I was religious; I told him I was Jewish. I was found guilty of misbehaving before I was guilty of misbehaving while visiting Temple Mount. And who is dictating the parameters of this misbehavior? My question to the Israeli authorities is: are Moslems allowed to have prayer books when they are praying at their mosque on Temple Mount? Since I was already in the sacred area I walked down to the Western Wall section to calm down and pray. While I spent a few long minutes at the Wall praying and chatting with some fellow praying women, a Moslem man standing on the bridge that takes you to Temple Mount, located just above the woman section where I stood, went berserk. 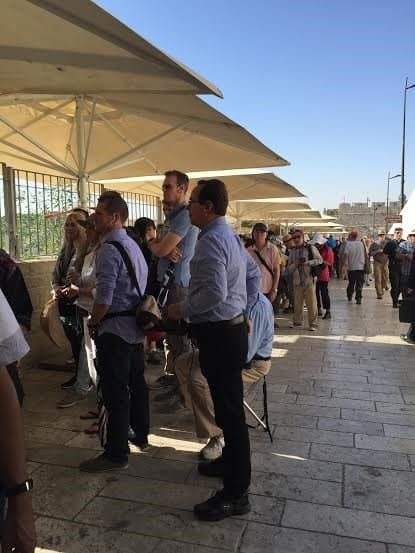 He repetitiously shouted, in the loudest of voice, some words among them “allahu akbar,” totally disturbing and disrespecting the Jewish women praying beneath. It took the authorities a long a while to get this madcap to stop his yelling. My question to the Israeli authorities is: who is dictating the freedom of religion on Temple Mount? Is it the tolerant Israel or the intolerant, fascistically uncompromising Moslems? My question to the Israeli authorities is: are you a democracy that offers tolerance by all to all or only by some to some? Perhaps it is better for me not to have been a witness to the disrespect the Moslems have toward the Holiest to Jews? Temple Mount is the Holiest to Jews, not the Moslems. It is a disgrace that the government of Israel allows such conduct to take place there while continuously declaring it is the “only democracy in the Middle East.” My question to the Israeli authorities is: is what you govern by a new type invented democracy or it is democratatorship? I was told that the day I tried visiting Temple Mount was the first day of the last ten days of the Moslem holiday Ramadan, a month of fasting to commemorate the first revelation of the Quran to Muhammad according to Islamic belief. During these ten days it has been “customary” for Moslems to camp and sleep on Temple Mount and cause a ruckus. To avoid clashes, for years, the Israeli authorities forbade visitors to go up to Temple Mount during those ten days. 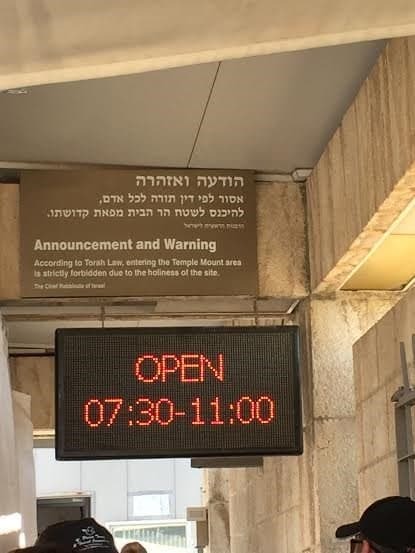 This year, no matter, Temple Mount was open to visitors during the permitted hours during Ramadan, even the last days of this Moslem holiday. Is this a small milestone to advance Moslem tolerance in Israel, so badly needed worldwide? In Israel there is no freedom of religion to Jews only to all other religions. When it comes to Moslems in Israel it is their “right” to freedom of religion and no one else’s. Since 1967, one government of Israel after another had ample opportunities to, step by step, correct this wrong and make it right. Demand and teach Moslem tolerance to all other religions. Yet, it chose not to act in that direction. The result is that I, a Jew, cannot freely go visit the place where the two Temples that housed the tabernacle, built by my ancestors, once stood.